Famed writer and New York native, Nora Ephron has died at 71 years of age. Ms. Ephron's work has spanned a variety of media from film to blogs, from books to director and more. One of Ms. Ephron's most well known film genre's includes romantic comedy, and two of her most well known screenplays were done for the films "Sleepless in Seattle" and "When Harry Met Sally." Her most recent film was "Julie and Julia." One of Ms. Ephron's recent books humorously focused on women and aging issues - "I Feel Bad About My Neck: And Other Thoughts on Being a Woman" and spent many weeks on the New York Times best seller's list. Ms. Ephron comes from a family of writiers and 2 of her sisters are screenwriters. Ms. Ephron directed 8 feature films including "You've Got Mail". Ms. Ephron worked as a White House intern for President John F. Kennedy. Her novel "Heartburn" so closely depicted her relationship that her ex-husband threatened her with legal action. 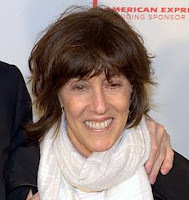 Ms. Ephron was celebrated with a BAFTA Award for Best Original Screenlay on "When Harry Met Sally".